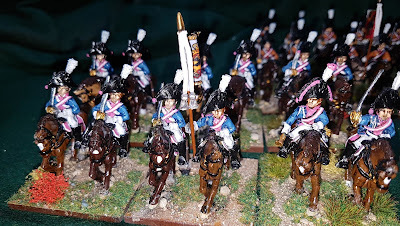 Saturday and Sunday saw me complete the basing of three more Prussian cavalry regiments for my 1806 Campaign army (but also for use in earlier French Revolutionary Wars scenarios). The three regiments I based up today joined by a fourth which I did some time ago. HR No. 8 von Blucher. These are maybe one of the best hussar castings I have come across, by Forgotten and Glorious Miniz of Paris. Dragoon Regt No 3. Casting Room Miniatures(Foundry) purchased in one of their 20% off sales. KR No 2. More Casting Room Miniatures. HR No 7 von Koeller. More FGMiniz figures, painted and based a few months ago but now joined by a little more muscle. Tomorrow I shall start the bases on a few battalions of Prussian Infantry but only after I've done those for His Majesty's 79th and 92nd Foot. My original battalions were in kilts etc which isn't correct for Flanders or the Helder Campaign (so pedantic Colin!) so I sold them on eBay (they are now well on their way to sunny Australia) and replaced them with Victorious Miniatures 1793/94 Scots infantry in plain white overalls. Of course I COULD have used my AWI Highlanders in gaiter trousers but couldn't do it in the end. More photos tomorrow I hope. Jocks not in kilts? Never! Like the cavalry though! Sadly yes, but happy you like the cavalry. 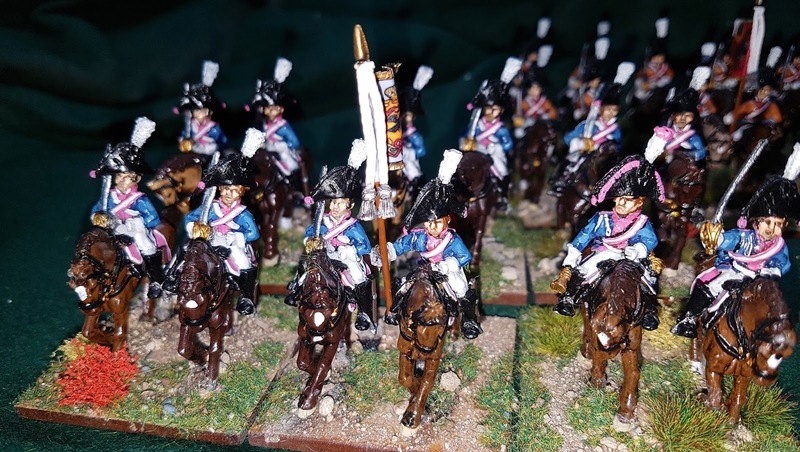 1806 Prussian army is one of my favourite, and your job is great! They are very good - especially the Hussars.